Talking with Tech Leads is a book by Patrick Kua for Tech Leads from Tech Leads. A leader, responsible for a development team, who spends at least 30 per cent of their time writing code with the team. Tech Leads prioritise team focus and harmony over writing code. This can be tricky when the technical aspects of the job are their favourite. Tech Leads allow developers to make mistakes as failure is a natural part of the learning process. They should provide feedback at the right time to maximise learning, while limiting the impact of failures. Tech Leads choose their words carefully as they know that the team will watch, observe and judge every word and every action. They have to control their emotions and maintain objectivity. Tech Leads focus on a few issues and let go of the rest to give them time to sort themselves out. Code is read more times than it is written so spend time writing clean code with clear variable names. Add comments when it is necessary to explain why the code is written that way and the decisions behind the implementation. Each software module should be responsible for a single aspect of the system. When software modules are written to act independently, the system can provide more combined functionality as a whole. A module should not delve into another module’s implementation (Law of Demeter). Ask for what you need directly instead of digging through the module hierarchy. Refactor early to prevent existing code dictating future code. Refactoring is a process that must be undertaken slowly, deliberately and carefully. Always take short deliberate steps and have good test coverage before you begin. Every piece of knowledge in a system should have a single authoritative representation (DRY principle). Developers will often duplicate code in the short term to ship faster, at the expense of duplicating effort to update that code in the future. Everyone writes bugs. Do not trust or expect yourself to write perfect software and do not blame third-party libraries for your mistakes. When you find a bug, try not to panic and concentrate on fixing the problem. The best way to start fixing a bug is to make it reproducible. This will also tell you when it is fixed. If you feel stuck, explain the problem to someone else as the act of explaining often reveals the solution. Try to fail early at the site of the problem. Errors should not leave the system in an inconsistent state, for instance charging a credit card but not processing an order. Projects with automated tests have a better chance of success. Accessible test code is an invaluable example of code use, with crucial benefit of alerting you of regressions as you make changes to the system. Build testing into the software from the beginning. Test each piece of the project independently with unit tests, then together with integration tests. When you design a module or even a single routine you should design both its contract and the code to test that contract. Put abstractions in code and details in configuration files. Configuration files allow an application to be customized without recompilation. This is extremely important in critical live systems which need to dynamically reload metadata while running to prevent downtime. Another use-case is distributing the same core app to different clients and enabling features based on their specific configuration. A question a lot of us mull over is “Where does the time go?” in our daily lives. I wanted to explore if there was an easy way to understand and improve our daily routines. The answer I thought of was a clock. 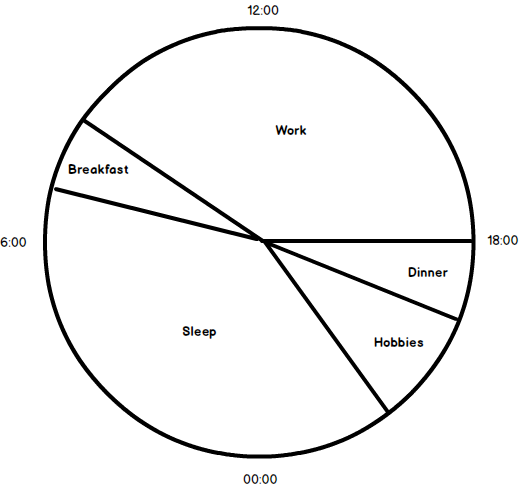 I marked points around the clock with the start and end points of each daily activity. At this point the clock began to resemble a pie chart. I extended it to encompass the whole 24-hours of the work day, including sleep. You can see at a glance the amount of time spent on each activity. In this example, work and sleep both occupy over two-thirds of the entire day. Only two hours were spent on hobbies, less than one-tenth of the day. Can we add more detail? To get more value and understanding, we need more information. At the moment, the above chart could apply to most of the population and it is not telling us much about the individual. Let’s see what happens when we take each segment of the previous graph and add another level of detail. This has become much more interesting. You are starting to see a picture of the individual outside of work. 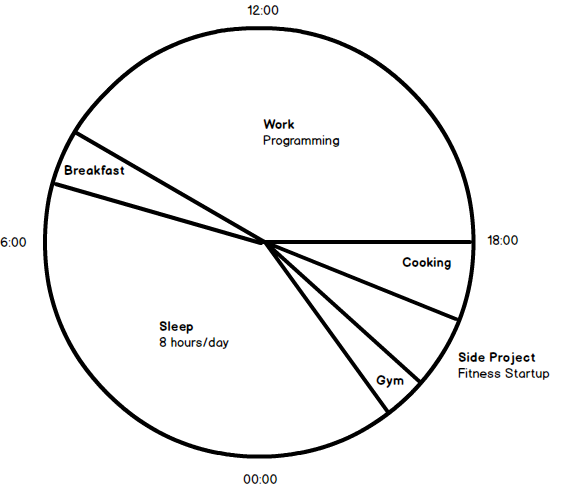 This person spends most of the day programming but also has a keen interest in fitness and health. You could split ‘Work’ up into its subcomponents too. This could be interesting if you wanted to compare roles or companies. On the other hand, most of us have less control over our working day, so other people would learn less about us as individuals. Would it change over time? These observations are useful to see how your life is evolving. For instance, if learning Spanish is your number one goal, are you gradually increasing the amount of time you dedicate to it? If you are tired at work, have you changed your lifestyle to incorporate more sleep? If the accountant wanted to adopt a healthier lifestyle, he could look at the chart of a healthier friend to identify changes he will need to make to reach his goal. I like the idea of representing your life on a clock. The clock concept answers the question “What do I do?” and “What does that person do?” It helps to highlight periods of time to reclaim from activities you do not want to do, so that you can reallocate this time to activities you do want to do. You could also measure how you are progressing by comparing the clock with a month ago.